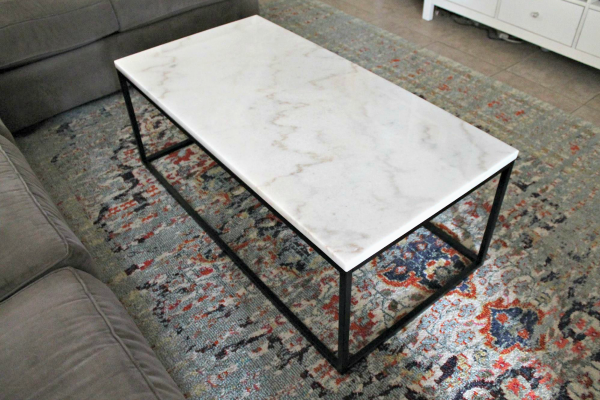 Originally I said that I was probably going to order the metal and marble coffee table from West Elm. I seriously love that table, but two things stopped me from ordering it. For one, it was expensive ($600 plus $50 white glove delivery), but the main reason was the size. It’s four inches smaller (length and width) than our current table, so I think it would be too small for the space. I just couldn’t justify spending that much money on something that wasn’t perfect. So I searched like crazy online and found a similar table at Hayneedle. It’s the same length as our current table and it’s only $230! To save even more money I bought a 10% off Hayneedle coupon code from eBay for $3.90. I was hoping to find one online, but it looks like they are all unique codes. I saved $23 with that code plus they offer free shipping. My total ended up being $207 (plus $4 for the coupon code), so over $450 cheaper than the West Elm version! The table shipped quickly and arrived well before the estimated date. 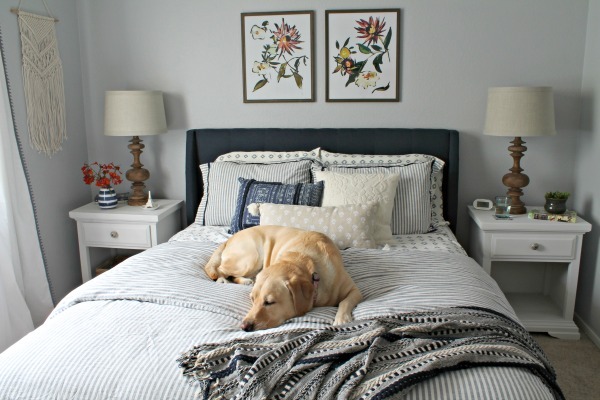 It arrived in two boxes – one for the metal frame pieces and one for the marble slab. The marble box was HEAVY! 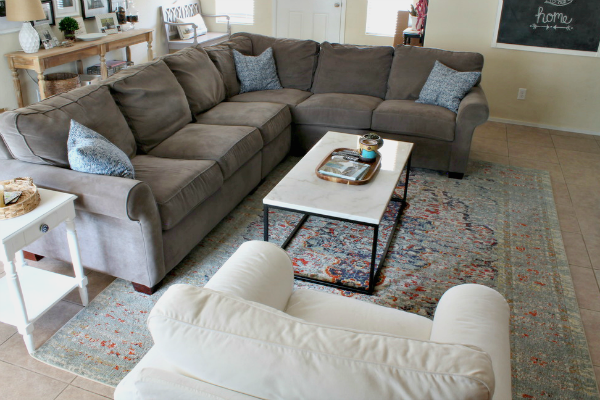 The table was fairly easy to assemble and it looks SO good for the price. The marble isn’t as white as it looks on the website and it has a lot more veining (which I like). 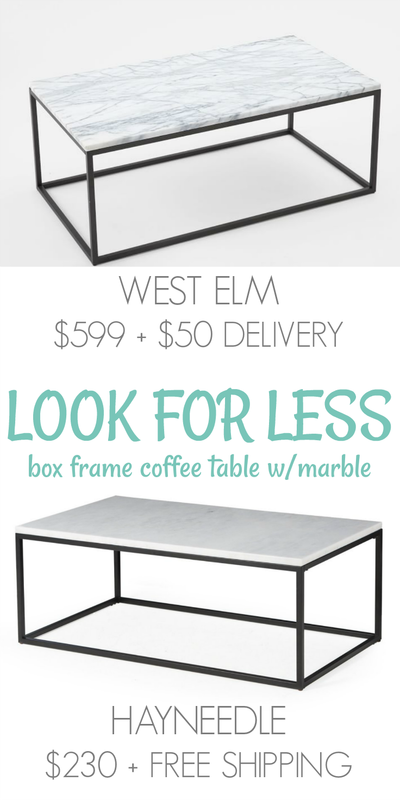 Based on the website pictures, I would probably prefer the marble on the West Elm table…but not for $450 more. I also ordered new pillow covers from The Pillow Cover Store on Etsy. I paid $50 for three 19” x 19” pillow covers, which seems like a killer deal. I briefly considered making the covers myself, but the fabric would have cost me almost as much as the finished covers. It was definitely worth the extra few dollars to have them made instead of procrastinating for months. I added a new wood tray from Target, but the rest of the accessories are the same as before or found in my stash. I think all that’s left to do in this room now is to replace the missing baseboard and some additional accessorizing/styling…and maybe a new end table. I’m so happy with how this room is turning out now. 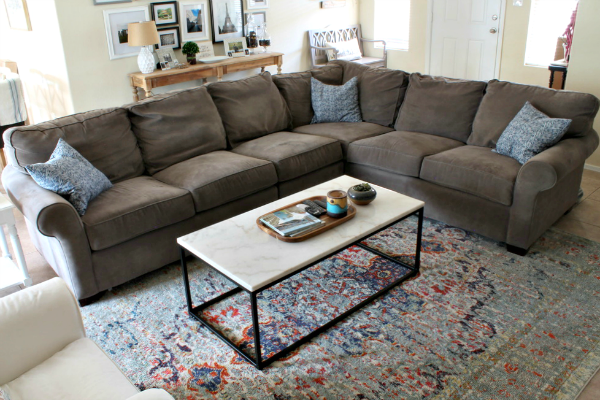 The new rug and coffee table have completely changed the vibe of the space and I love it! Ooooh we have a table frame almost exactly like that, but right now it has a glass top. I'd love to get a marble top for it. I love your rug, too! What a great find! It looks terrific!! oh my gosh! What an incredible find!! Everything looks so lovely. You can buy coupon codes on ebay? Why didn't I think of that. That's genius!! The marble is lovely. I can't believe you got such a deal!! This is a cute little table! I bet it'd be a perfect prop for flatlay pictures and such! Brilliant idea! Im totally obsessed with all things marble at the moment!